An alternative response to the editorial problems of this multiple-text play. Like most critical editions, it presents the early texts in a manner helpful to the general reader by modernizing spelling and punctuation, and emending nonsensical readings. However, it does not hide the text’s diversity by exclusively selecting readings from either the Second Quarto or the First Folio in order to reconstruct a single-reading version corresponding to the authentic «Hamlet». Rather, it makes their significant variants immediately available in the line itself (offering alternative editorial interpretations of identical or similar reading at certain points). 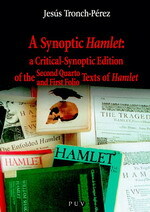 Thus the reader can have a direct appreciation of the divergence and similarity between these early texts from which the «Hamlet» of today is known.